Click here for "Access TO Shonan"
It runs "Narita Airport (or Kazusa-ichinomiya or Kimitsu) => Chiba => Tokyo => Yokohama => Ofuna => Kamakura => Zushi => Yokosuka => Kurihama". 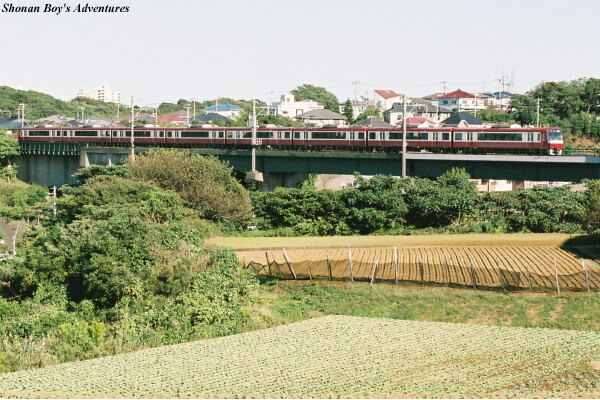 The Yokosuka line train running nearby Engaku temple. Most of the Yokosuka line trains are local. This car is the same series as the Tokaido line train. 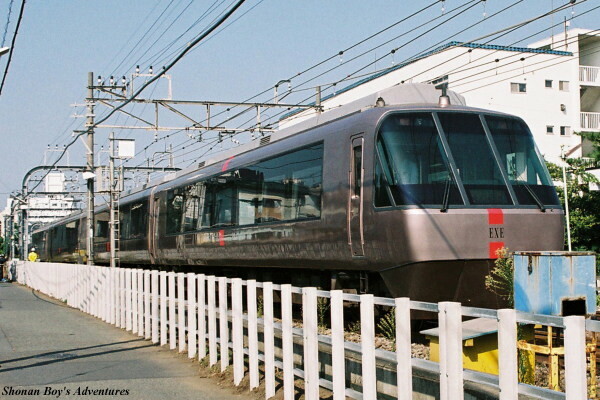 the "Narita Express" (N'EX). The N'EX bound for Ofuna links Narita Airport with Ofuna (in Kamakura city). The destinations are for Ofuna, Yokohama, Shinjuku, Ikebukuro, Omiya, Takao. All seats are reserved. The Tokaido line trains go toward Ofuna & Fujisawa directions, from Tokyo. On Shonan Shinjuku line, there are 2 routes. One is via the Yokosuka line "Utsunomiya line (Tohoku line) => Omiya => Shinjuku => Yokohama => Totsuka => Ofuna => Yokosuka line". The other is via the Tokaido line "Takasaki line => Omiya => Shinjuku => Yokohama => Totsuka => Ofuna => Tokaido line". 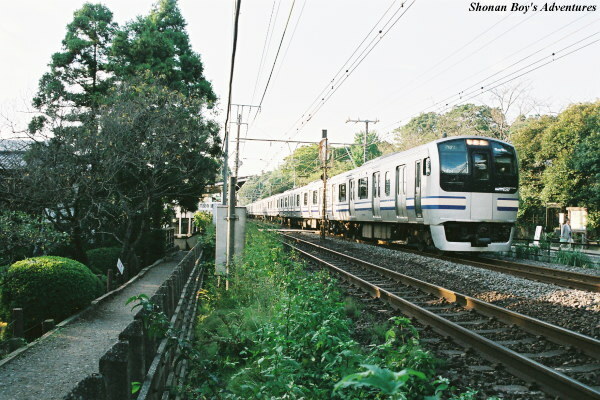 The name of "Shonan Shinjuku line" is by-name. It may be appropriate to board local or rapid train when passengers from Tokyo or Yokohama areas. When passengers use "Green Car (First-class car)" on local train (Yokosuka line, Tokaido line & Shonan Shinjuku line), "Green car ticket for non-reserved" is required. There are Green Cars in most of these trains. All seats on the "Narita Express" are reserved. If seats of it are full, "Standing limited express tickets" will be sold (limited standing tickets). If passengers miss the Narita Express, they can board the following Narita Express of the day with standing. Even if seats will be vacant, "standing ticket passengers" and "passengers missed Narita Express train" will not be able to take seats. "Kamakura Enoshima Frii Kippu" (for 2 days). Ticket users can use the round-trip of JR (greater Tokyo) + unlimited boarding area (all sections of Enoden + all sections of Shonan Monorail + JR Tokaido line local between Ofuna and Fujisawa + JR Yokosuka line local between Ofuna and Kamakura. It is sold at major stations of greater Tokyo (each station of Yamanote line, Kawasaki, Yokohama, Shin-yokohama, Yokosuka, etc). But not sold in the unlimited boarding area. For further informations, please ask JR-East. Green limited express (Kaitoku) train. No limited express ticket required. It runs toward Miura peninsula from Shinagawa, Sengakuji, and so on. Also it links with Toei Asakusa line, Keisei line and Hokuso line. Passengers going to Misakiguchi direction, please board a green limited express train (called "Kaitoku"). Red limited express trains (called "Tokkyu") are operated at a part of time zone (early morning, midnight and rush hours). Passengers for Uraga direction, please transfer for the local train at Horinouchi. Passengers for Shinzushi directions, please transfer for the local train at Kanazawa-hakkei. Passengers boarding from Haneda Airport, please take the train for Misakiguchi, Uraga or Shin-zushi directions. 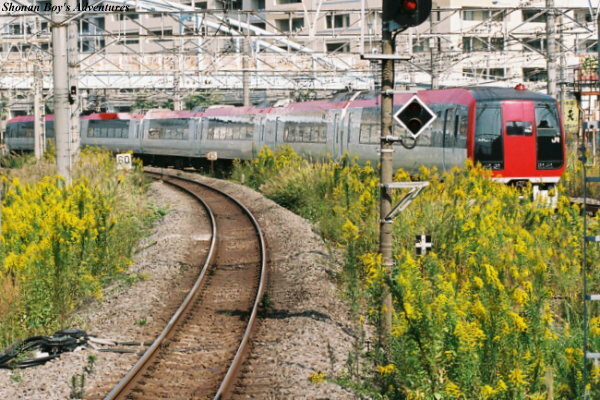 Depending on the train, passengers should change trains at Keikyu Kamata or Keikyu Kawasaki. The green limited express bound for Uraga is uncoupled at Kanazawa-bunko with bound for Misakiguchi (or for Keikyu Kurihama), and trains for Uraga will run as the local train from Kanazawa-bunko. Limited express ticket is not required. But regarding the "Wing" (operated in the evening on weekdays, outbound only), the "Wing" car reservation ticket is required. The round-trip excursion ticket "Miura Hanto 1 day Kippu" and "Miura Hanto 2 days Kippu" available. Round trip of Keikyu + unlimited boarding area (sections South from Kanazawa-bunko of Keikyu) + specified sections of bus (toward sightseeing spots inside Miura peninsula mainly) + privileges of sightseeing facilities. Ticket for 1 day, it is sold at each station of Keikyu other than Sengakuji. Ticket for 2 days, it is sold at sections between Shinagawa and Kamiooka, Kuko line (airport line), Daishi line. For further informations, please ask Keikyu. All seats are reserved. It is useful for the passengers who prefer comfortable trains. local train. It is the same series as a rapid express train and an express train. No express ticket required. 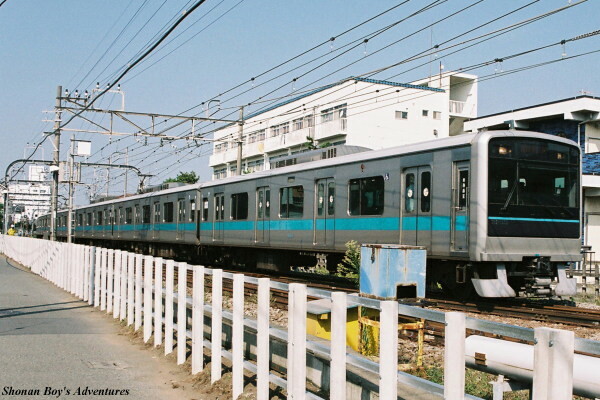 Odakyu line consists of 3 lines; Odakyu Odawara line, Odakyu Enoshima line and Odakyu Tama line. Trains goiing to Katase-Enoshima run "Shinjuku => Odakyu Odawara line => Odakyu Enoshima line => Fujisawa => Katase-Enoshimma. 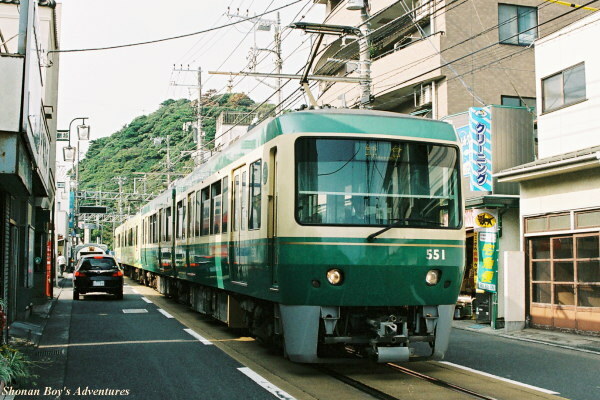 From Shinjuku, passengers can go to Katase-Enoshima directly. 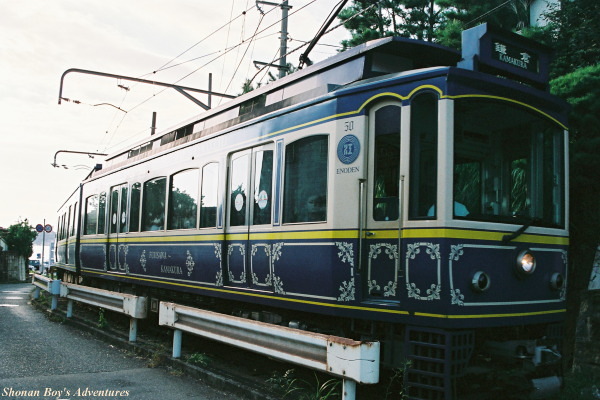 The fastest train of the "Enoshima" takes 62 minutes. As all seats are reserved, please be sure to reserve seats in advance. Reservations are also accepted at the stop station of limited express (vending machine accepted, too). 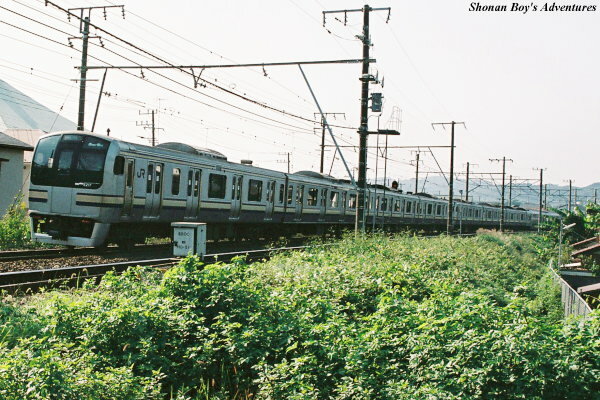 These trains are operated by commuter trains, and they go only to Fujisawa (A few of them go to Katase-Enoshima). Express tickets are not required (only fare ticket). If you board the train bound for Fujisawa, please transfer for local train bound for Katase-Enoshima at Fujisawa. The round-trip excursion ticket "Enoshima-Kamakura Freepass" available (for 1 day). Ticket users can use the round trip of Odakyu to Fujisawa + unlimited boarding area (the whole of Enoden line + Odakyu between Fujisawa and Katase-Enoshima except the "Enoshima" limited express) + privileges of sightseeing facilities, etc... If you purchase a limited express ticket, you can use with it. This excursion ticket is sold at each station of Odakyu line (vending machine, departure day only), Odakyu Travel (travel agency), some travel agencies. For further informations, please see an Odakyu website or ask Odakyu. An Enoden train running along Shiri-ga-hama (beach). It is specutacular between Inamuragasaki and Koshigoe. Running on the car road between Enoshima and Koshigoe. There are sharp curves. It runs at 40km/h on the straight line, and it reduce a speed into 20km/h at the sharp curve. Recently new cars with a retro flavour have been adopted. There is only one line in Enoden. Between Fujisawa and Enoshima, it takes 10 minutes (But no beach view). Between Kamakura and Enoshima, it takes 25 minutes, however, the view of Sagami Bay from train is specutacular! The Enoden is the most specutacular view in railway companies running in Shonan. As the roads of this area are extremely crowded because of many cars, Enoden is convenient because it is not influenced by traffic jam. All the trains are local, and run once every 12 minutes in the daytime. 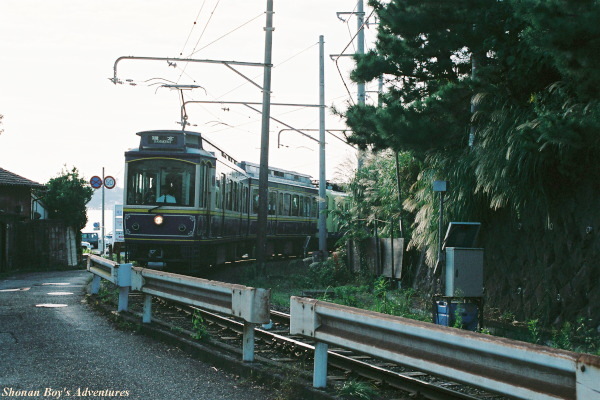 Please call this line "Enoden" (= Enoshima Dentetsu Enoshima line). Please do not call it just "Enoshima line", or it will get confused "Enoshima Electric Railways Enoshima line, with Odakyu Enoshima line, or Shonan Monorail Enoshima line." "Nori-ori-kun A-ticket", the excursion ticket (for 1 day). Ticket users can board the whole Enoden line, and buses between Kamakura station and Ofuna station with unlimited boarding. Privileges of sightseeing facilities are applied. This excursion ticket is sold at the station of Kamakura, Hase, Gokurakuji, Inamuragasaki, Shichirigahama, Koshigoe, Enoshima, Kugenuma, Fujisawa. "Nori-ori-kun B-ticket" are also available (for 1 day). Ticket users can use the whole Enoden (train only) with unlimited boarding. Privileges of sightseeing facilities are applied. This excursion ticket is sold at the station of Kamakura, Hase, Gokurakuji, Inamuragasaki, Shichirigahama, Kamakura-koko-mae, Koshigoe, Enoshima, Kugenuma, Fujisawa, and some travel agencies and hotels. For further informations, please ask Enoden. Suspended monorail system is adopted. Passengers may think this train is flying, when it is running and they look down. 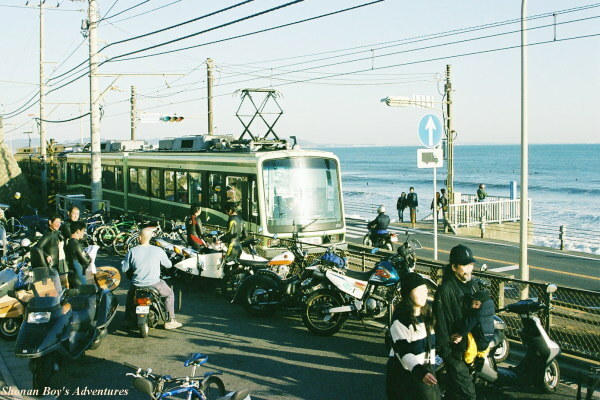 The Shonan Monorail Enoshima line operated between Ofuna and Shonan Enoshima. 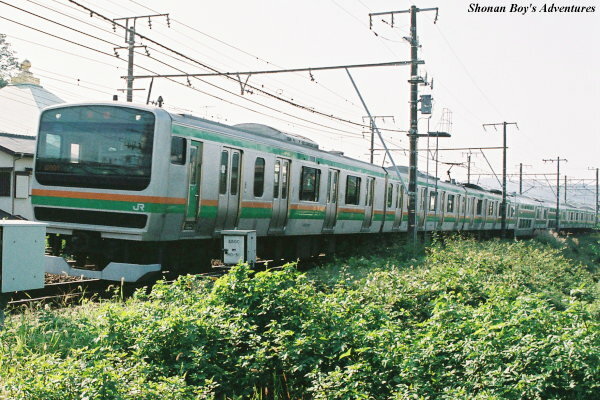 All trains stop at all stations, and it takes 14 minutes between Ofuna and Shonan Enoshima. It is operated once every 7 minutes 30 seconds. 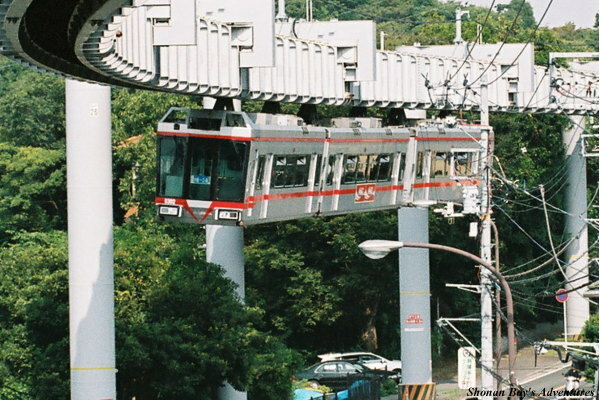 People call it "Shonan Monorail" only. But please do not call just "Enoshima line".